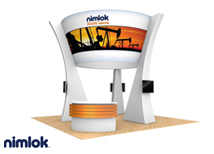 Custom displays are the most unique trade show displays available. We use products manufactured by Classic Exhibits because they are affordable and constructed with the highest quality materials. 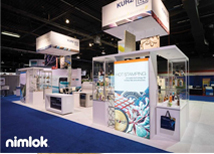 Our exhibit design search feature allows you to search our entire selection of products from Classic Exhibits to find the perfect display option. 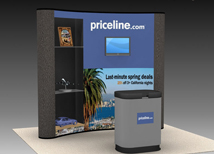 Custom displays are also great when launching a new product or a new company appearance. 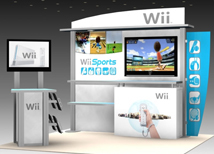 These trade show displays will make you look better than any competitor at your trade show! 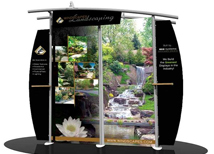 Northwest Creative Imaging offers a unique custom display experience that does not require a showroom or a local rep. This helps to save money without sacrificing your design. We use Skype and other communication methods to work through the design stage. Since Northwest Creative Imaging and Classic Exhibits are only 3 hours from each other, your display can be monitored throughout the construction process. 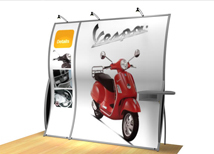 Custom pop up displays combine portability with unique features to fit your exhibiting needs. We have multiple styles and sizes to choose from! Eco Systems Displays are the most environmentally friendly display systems available. They are not only easy to assemble but are also innovative and modern! Visionary hybrid displays are on the higher end of the budget, but you get every dollar you pay for! Design and quality that is one of a kind! Many sizes and styles available! Perfect 10 hybrid displays are clean and modern. They are affordable yet offer a unique, modern look to accent your companies style and character! One of the best options for someone on a budget that does not want to sacrifice style. Magellan systems are affordable and offer endless design options! Best Value in Custom Displays! Sacagawea displays offer a more mainstream style while offering many options. These systems are very affordable and can be easily customized! 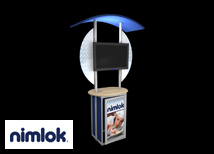 Custom kiosks and workstations are ideal for exhibitors and retailers looking for a portable and unique kiosk solution. There are endless designs available! 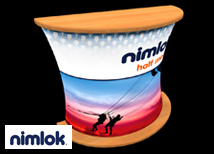 Custom Counters are great option for exhibitors looking for a portable counter to accent their trade show booth. There are multiple sizes and designs available! Custom island exhibits will work great in any island booth. Most of these displays can break down to form smaller displays for smaller booths! Custom rentals allow you to look professional on a small budget. 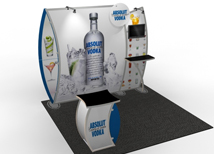 There are multiple sizes and styles to fit any booth space! Custom designs without a custom price! Custom displays require a unique manufacturing ability and design experience to get the most ROI from your system. There are many factors to be considered including modularity, replacement graphic costs, and ability to expand. When looking for a custom display provider is important to find a company who uses a reputable manufacturer(almost all retailers do not construct in house) and a company who has experience in the custom display market. 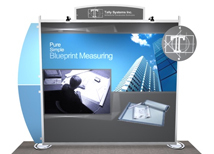 Most things in the trade show industry are very confusing and custom displays are at the top of the list. Northwest Creative Imaging uses years of experience in the trade show industry and as end uses to help every customer find a custom solution that will work for them. We understand budget is key when shopping for expensive custom units and we control our overhead in order to maximize saving to our end users without compromising service. Please make sure to view our testimonials page to see what customers think about us!